I’m not a fan of Madonna but when trying to come up with a title for today’s blog, I just couldn’t help myself paraphrasing one of Madge’s song lyrics (Who’s that Girl). 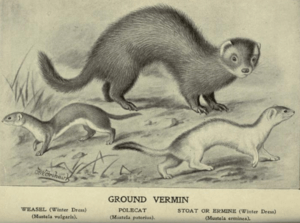 In the series headed Mustalids, the weasel features in this blog not just because my favourite English language book happens to be Kenneth Grahame’s Wind in the Willows! You will probably recall how Mr Toad’s troubles worsened when he encountered ferrets and weasels and Toad Hall fell into their paws – no, I’m writing about the smallest of all mustalids, because just like the irrepressible spammers who have sent close to 600 spam messages to this blog site in less than a month, the weasel is a mysterious creature to whom we attribute all sorts of ill-spirited mischief. Wikipedia tells me that in early modern Mecklenburg German people carried around weasel amulets believing such items had exceptional magic qualities and that weasels were best slaughtered between the 15th August and 8th September. Well Wiki, I don’t know where you got this data from…but I grew up just around the corner from Mecklenburg and this is the first I’ve heard of it. There was no ritual weasel-slaying in our patch and my Dad, who was born in Mecklenburg and who’s not normally known to shrink away from a good, utterly idiotic superstition, has never worn or owned a weasel amulet either. Never has one animal had so many roles to play as the much-maligned weasel! In some countries the weasel represents good fortune, in others it’s a sign of evil before a girl’s wedding or the bad omen that signifies sudden death, while in most farming communities weasels are regarded as chicken-killing-machines, vermin and thieving little so-and-sos. My Willow the Vampire thinks weasels are cute and are the victims of bad press, just like the blood-sucking fraternity. So who’s that weasel, when it’s at home? Weasels are carnivores like all other mustalids. Their coat is typically reddish to brown in colour, although the Malaysian weasel is unusual in its colourings: its body fur has a slightly darker colour than its head and it’s more golden in hue than red or brown. Weasels grow to between 12 to 45 centimetres in length with elongated, agile bodies that have long tails. Weasels are very good at leaping and scampering about, given they have very short legs. Some weasel family members even sport a white winter coat in regions with regular snowfall. Weasels are exceptionally persistent hunters and will follow their prey into underground burrows und pursue them under snow. The only habitats they haven’t conquered so far are Australia, Antarctica and a few islands. Despite their slight weight and slender bodies, weasels are remarkably strong and can carry up to half their own body weight in food. The smallest member of the Least Weasel family can weigh as little as 35 Gramm, while the largest weasel still only weighs in at 250 Gramm. Weasels hunt mostly voles and mice. Although technically in competition for food, the weasel will often share its territory with larger members of the mustalid family like the stoat for example. By concentrating on food sources the stoat isn’t so keen on, the weasel has carved out a niche living for itself. Larger weasels might even tackle rabbits and generally won’t say no to Rat Alfresco either. Long-tailed weasel ladies can give birth to at least six babies, typically in May, when there’s plenty of prey about. The mother teaches her offspring how to hunt and when they’re just 8 weeks old, they are ready to go out hunting for themselves. The weasel lives mostly a solitary life, only getting together with other weasels at mating time. Writing this, it strikes me how often we use animals to describe people in a negative way: He had a ferrety face – what a weasel! – he weaselled out of the deal – he behaved like a pig – she looks like a warthog – he dances like a hippo on ice – did you see that dog on his arm?- what does the old cow think she’s doing?- you sly old dog – why are you so ratty today? Why exactly do we attribute negative human character traits to animals – is it so the “human” in us doesn’t get too upset when others hold up a mirror and we don’t like what we see? Just like we’re seemingly unable to decide what role we want the weasel to play – good or bad – we don’t seem to be able to make up our minds about vampires and werewolves either lately. Having just read various review blogs on the subject of vampire romance and werewolves’ redeeming qualities, I feel our old perceptions of fantasy creatures are undergoing a renaissance-type enlightenment…perhaps good and evil isn’t quite as clear cut as we’ve been led to believe by our aged aunties, Sunday-school teachers and a staple diet of John Wayne westerns? Do weasels ever get to wear the white Stetson or have humans condemned them to wear the villain’s black hat forever? Are weasels friend or foe? So, who’s that weasel? It’s a splendid little creature just trying to survive in an ever shrinking habitat. What a great image…of weasels wearing white Stetsons. thanks for the compliment. I’ve seen a few weasels in the wild and they are very cute indeed – also very shy and increadibly fast.